Jonathan Edward "Jon" Bernthal (born September 20, 1976) is an American actor best known for his television role as Shane Walsh on the AMC series The Walking Dead and film roles in The Wolf of Wall Street (2013), Fury (2014), Sicario (2015) and The Accountant (2016). He portrayed Joe Teague in Mob City, and Punisher in the Netflix series Daredevil and is set to reprise his role in the Netflix series The Punisher. Bernthal was born and raised in Washington, D.C., the son of Joan Lurie (née Marx) and Eric Lawrence "Rick" Bernthal, a lawyer with Latham & Watkins LLP. His paternal grandfather was musician and producer Murray Bernthal. He has two brothers, Nicholas and Thomas. His family is Jewish. Bernthal at the Phoenix Comicon in 2012. In June 2015, Marvel announced that Bernthal would portray Frank Castle / The Punisher in the second season of Netflix's superhero series Daredevil, which was released on March 18, 2016. He will then star in the Irish action thriller film Pilgrimage, alongside Tom Holland and Richard Armitage. Together with his brother Nicholas, an orthopaedic surgeon at UCLA, Bernthal runs a nonprofit organization called Drops Fill Buckets, described as an "impact-driven, entrepreneurial approach to making a difference". 2002 Law & Order: Criminal Intent Lane Ruddock Episode: "Malignant"
2004 Without a Trace Alex Genya Episode: "Bait"
2004 Dr. Vegas Greg Episode: "Dead Man, Live Bet"
2004 Boston Legal Michael Shea Episode: "Questionable Characters"
2005 Jonny Zero Brett Parish Episode: "I Did It All for the Nooky"
2005 Law & Order: Special Victims Unit Sherm Hempell Episode: "Goliath"
2005 How I Met Your Mother Carlos Episode: "Purple Giraffe"
2010 Numb3rs Mike Nash Episode: "Growin' Up"
2012 Harry's Law Lucas Trassino Episode: "The Whole Truth"
2012 Robot Chicken Hawkeye / Mayor of Des Moines (voice) Episode: "Collateral Damage in Gang Turf War"
1 2 "Descendants of Nechah Oifman". Ancestry.com. ↑ "Looking Backward". Watertown Daily Times. September 20, 2009. Today's Birthdays: ... Actor Jon Bernthal is 33. ↑ "Murray Bernthal dies at 99". BWW News Desk. December 11, 2010. ↑ "Obituary – Murray Bernthal". The Post-Standard. December 12, 2010. 1 2 "Jon Bernthal". Hollywood Life. 2010. Retrieved December 17, 2010. 1 2 "Michael Segal Weddings". ↑ Patrick, Andy (April 30, 2010). "Exclusive: Sarah Wayne Callies Joins 'Walking Dead'". Entertainment Weekly. Retrieved January 14, 2012. ↑ "Harry's Law Casts Jon Bernthal". TVLine. Retrieved March 3, 2012. ↑ Andreeva, Nellie (March 12, 2012). "CW's 'Beauty & The Beast', 'First Cut' Add To Casts; Jon Bernthal Set For TNT's 'Noir'". Deadline.com. ↑ Fleming Jr., Mike (June 19, 2012). "'Walking Dead's Jon Bernthal Joins 'Wolf Of Wall Street'". Deadline.com. ↑ "The Walking Dead's Jon Bernthal Joins Stallone And De Niro In Grudge Match". CinemaBlend.com. December 14, 2012. Retrieved July 8, 2013. ↑ Sneider, Jeff (May 17, 2013). "'Walking Dead' Alum Jon Bernthal in Negotiations to Join Brad Pitt in David Ayer's 'Fury' (Exclusive)". TheWrap. Retrieved May 23, 2013. ↑ Ford, Rebecca (May 29, 2014). "'Walking Dead' Star Jon Bernthal Joins Denis Villeneuve's 'Sicario' (Exclusive)". The Hollywood Reporter. ↑ "'Sicario': Cannes Review". Retrieved 2016-07-22. ↑ Goldberg, Lesley (June 9, 2015). "'Walking Dead' Star to Play Marvel Favorite the Punisher on Netflix's 'Daredevil'". The Hollywood Reporter. 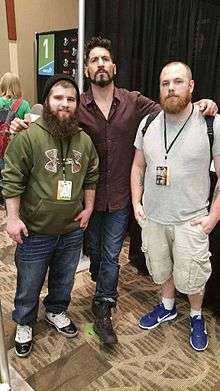 ↑ ""The Walking Dead's" Jon Bernthal Goes On a 'Pilgrimage'". Bloody Disgusting. ↑ Webber, Stephanie (March 12, 2015). "Jon Bernthal, Former Walking Dead Star, Welcomes Daughter Adeline". Us Weekly. ↑ Blodgett, Lucy (January 27, 2012). "Drops Fill Buckets: Party With Jon Bernthal For Charity". The Huffington Post. ↑ "Drops Fill Buckets: Key Players". Drops Fill Buckets. 2011. 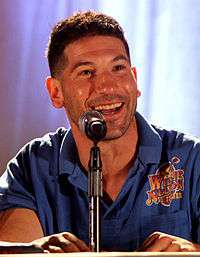 Wikimedia Commons has media related to Jon Bernthal.